Haplotypes, as they specify the linkage patterns between dispersed genetic variations, provide important information for understanding the genetics of human traits. 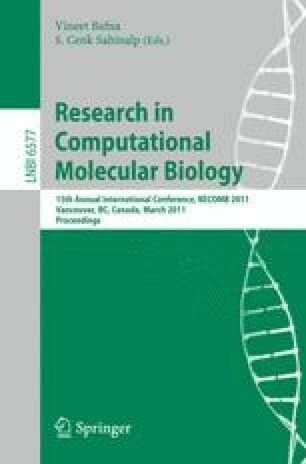 However haplotypes are not directly available from current genotyping platforms, and hence there are extensive investigations of computational methods to recover such information. Two major computational challenges arising in current family-based disease studies are large family sizes and many ungenotyped family members. Traditional haplotyping methods can neither handle large families nor families with missing members. In this paper, we propose a method which addresses these issues by integrating multiple novel techniques. The method consists of three major components: pairwise identical-bydescent (IBD) inference, global IBD reconstruction and haplotype restoring. By reconstructing the global IBD of a family from pairwise IBD and then restoring the haplotypes based on the inferred IBD, this method can scale to large pedigrees, and more importantly it can handle families with missing members. Compared with existing methods, this method demonstrates much higher power to recover haplotype information, especially in families with many untyped individuals. Availability: the program will be freely available upon request.